PITTSBURGH, Pa., Mar 13, 2018 (SEND2PRESS NEWSWIRE) -- Delta Care Rx, a leading pharmaceutical innovator in end of life care, announces an exciting interface with HEALTHCAREfirst, a leading provider of web-based home health and hospice software, billing and coding services, Consumer Assessment of Healthcare Providers and Systems, or CAHPS, Surveys and advanced analytics. 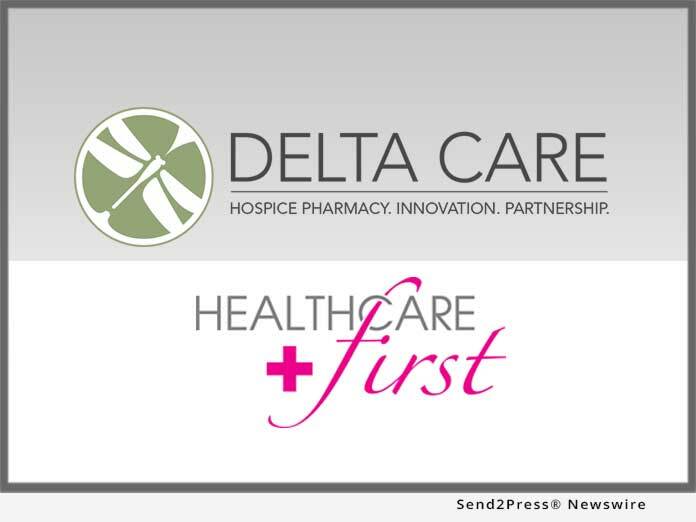 The partnership enables Delta Care Rx Hospice pharmacy solutions to interface effortlessly with the HEALTHCAREfirst comprehensive electronic health records, or EHR, systems, including firstHOSPICE and firstHOMECARE. "Delta Care Rx enjoys a growing segment of users within our customer base," says J. Kevin Porter, CEO of HEALTHCAREfirst, citing a recent, internal survey of clients. "This partnership strategically provides the interface those hospice clients need to create greater ease in workflow." For example, when a nurse inputs patient information into the HEALTHCAREfirst EHR, it appears in Delta Care Rx's e-tools automatically. The automatic transfer of vital information saves valuable time, reduces error, and improves patient care by reducing the effort required to ensure patients receive medications needed for quality outcomes. In the future, a pharmaceutical interface will make it possible to order medications directly from the EHR. Users will also have the option of utilizing Delta Care Rx's user-friendly durable medical equipment (DME) management software and provider network. Again, as patient demographic information proves readily available in the e-tools software suite, there's no task repetition. Delta Care Rx pharmacy and DME orders can be placed from any digital device, including smart phones. There is no additional cost to HEALTHCAREfirst users who choose to add this interface. "Managing pharmacy, alongside DME inside the same platform, definitely saves time and capital," says Drew Mihalyo, president and COO at Delta Care Rx. "This interface saves duplication of labor across the board for clients who already use a very powerful product via HEALTHCAREfirst." Delta Care Rx partners with EHR vendors, like HEALTHCAREfirst, within the hospice industry to provide EHR clients with easy to use, innovative interfaces to enhance clinical efficiency and reduce operating costs. HEALTHCAREfirst - http://www.healthcarefirst.com/ - provides web-based technologies and services to improve business and clinical operations for over four thousand home health and hospice providers across the United States. Based in Springfield, MO, and one of the fastest growing providers of its kind, the company provides, in any combination, agency and clinical management software; outsourced revenue cycle management services including billing, coding and home health Outcome and Assessment Information Set, or OASIS, Review; CAHPS surveys; and advanced analytics. HEALTHCAREfirst's breadth of solutions offers agencies a single source to improve patient care, create operational efficiencies, increase profitability and simplify CMS compliance. With HEALTHCAREfirst, agencies can focus on patients instead of paperwork.